Vetiver, Cedarwood and Halamadiare 10 sticks of unique ayurvedic blends designed to create a soothing and balanced environment, in which relaxation of the body, mind and spirit can occur. 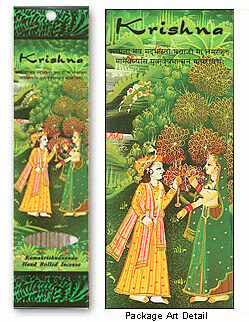 Krishna Hand Rolled Incense Sticks of Vetiver, Cedarwood and Halamadi, "the embodiment of love and divine joy." Krishna is a trickster and lover, an instigator of experiences that bring the knowledge that destroys all pain and sin. He was born to establish the religion of Love. These popular, large red sticks carry a feminine energy and the fragrance’s purifying effect lingers for hours, lightening the air in the room, enhancing devotion and helping to uplift any mood. Name explanation: Ganga is the Goddess of heavenly water and the Sanskrit name for the famous and holy Ganges River in India. Goddess Ganga manifested on earth as this sacred river in order to wash away the sins and impurities of humanity.